The competition was tough and the judges had a hard decision on their hands, so a big shout out to all the competitors - Kylan Ambrum, Ian Bennell, Cy Fahey, Yvette Holt, Dave Human, Kasey Johnson, Maryanne Johns, Micah Kickett, Maggie Walsh, Trent Wilson and Jay Wymarra. Deadly Funny producer Wes Snelling said after the event 'Every single act on stage smashed and nailed it. From Jay Wymarra who exclaimed post-show ‘I don’t care about winning, I just played The Forum!’, to Kasey Johnson doing her second ever gig, to host Steph Tisdell hugging the audience verbally and bringing the laughs throughout the show’s entirety. The content was overwhelmingly diverse with new big ideas and realities being brought to the table and delivered with exquisite comic timing. The true success was the camaraderie developed by the performers, and the love in the room from the 500-odd audience members from all walks of life was palpable'. 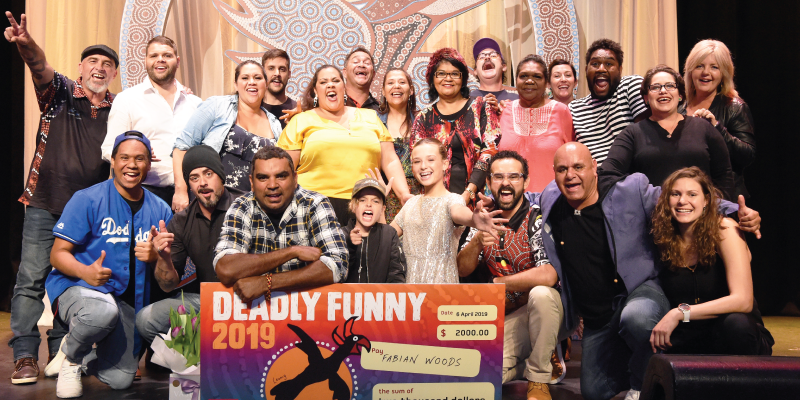 The Deadly Funny National final will be broadcast on SBS & NITV later in the year, so keep an eye out!